If you have a budding artist in residence, rest assured that there are plethoras of books available to teach kids to draw. Often times, children who love to draw, can be self-instructed by using these types of books. 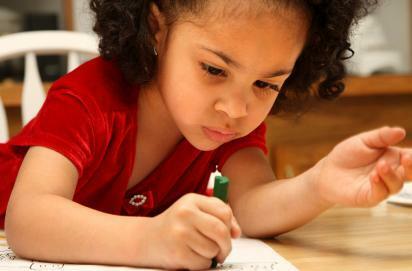 What type of book you use to help teach your child to draw should be based on your child's learning and drawing style. As always, you should consider your child's interest in art before purchasing anything. It's better to check out various approaches at the library before buying. Appropriately dubbed "The Only Book You'll Ever Need To Be the Artist You've Always Wanted to Be", Art for Kids breaks drawing down step by step, teaching kids to draw by both offering solid technique and a strategy for envisioning the finished product. There is also an "Art for Kids" series for kids who are interested in cartooning, using watercolors, etc. This is not exactly a book for children but rather for the adults that teach them. Using a very unique approach, Mona Brooks (the author), encourages children to observe the lines and shapes of the objects that they wish to draw thus rendering something realistic. Interestingly, she encourages the adults to draw alongside the children as they explore art together. Classically a favorite among kids, Ed Emberly's drawing books use a combination of finger printing and drawing to render cute and cartoonish pictures. While it is fascinating to discover all the things you can make out of fingerprints and a few additional lines here and there, kids are likely to become fascinated with both the simple art they are able to create and the fun of using stamp pads as a medium. How To Draw 101. . . Anything that you can possibly imagine from monsters to space ships is included somewhere in this series of drawing books. This series is great for a kid who wants to explore drawing but really has no experience with it. The book has step-by-step instructions and if your child follows the instructions well, they will render a somewhat realistic drawing regardless of their ability. Consequently, this is a great series for building confidence. The folks from Faber and Castell are paired together with Creativity for Kids to come up with this great introduction to more advanced techniques in drawing. While the book covers all the basics, it also covers more difficult concepts like viewpoint, lighting and hatching. Don't be scared off into thinking that this book is only for those who are serious artists. On the contrary, the book is for anyone who wants to be inspired to learn to draw. The Draw 50 series of books offers kids a step-by-step approach to drawing that is so simple, anybody could pick it up and learn. The books are each themed so that your child is learning to draw within that theme of items. In theory, they should be able to draw and entire scene when they are finished with the book. Getting drawing books is a great way to encourage students to use their creative minds. If you can pair art activities along with something your child is learning in school, you will find that you have a winning combination.